My hair is fine, but it may be thin, too, at least in places. My overall ponytail circumference is between 2" and 3"
but the sides of my hair in the temple down to infront of my ears is so thin. It has always been this way, so it is not a hair-loss situation. It is so bad that if my hair has not been freshly shampooed and I put it up I can see scalp on the sides. To combat this, I put it in a low ponytail and then the sides of my hair are better covered. I have thought about not growing my hair out because of this, I've thought about cutting the hair in front of my ears into short wispies and let the rest grow, sort of faerie-hair. But I really don't want to cut it. I thought of Rogaine but since it has always been thin on the sides, I'm not sure it would work. Has anyone else had anything similar? I feel like I'm the only one and that maybe I can't have long hair because of this. NOPE! You're not the only one! Welcome to the club, sister! I have the same problem - a bit thin on the sides, and now more recently kinda thin on the front hairline as well. I wouldn't touch Rogaine because I don't want to be stuck using that for life. The follicle booster sounds interesting, Babyfine. What is it? You both confirmed what I was thinking about the Rogaine; I'm not ready to make that kind of commitment. I've seen Nioxin advertised but really don't know what it is. Any info on that at the booster, Babyfine! I'm sorry you two have the same problem but it sure is nice to know I'm not the only one. ingredients. I don't know if you can get it overseas. iron and blow dryer that I used to do. Hey, that just reminded me of a question I've been meaning to post for some time. What exactly do those Sulphates in shampoos do? Also, does anyone know which ones you are ok with and which ones you should avoid?? I'm going to nioxin.com to check it out! I don't have too much of an issue with sulfates. I think my hair needs some because everything builds up on it so easily. I do try to stick with the SLES and cocoa? betaine and soaproot? as the cleansing ingredients but will use an all out sulfate if my hair feels real coated with something and nothing else will get it out. I think it is in the hair recipe section at the top Bikerbraid has compiled a huge list of ingredients and it tells which sulfates are milder. It's an incredible piece of work! I would lean toward not thinking you've done anything in the past to cause enough damage to cause thinning. 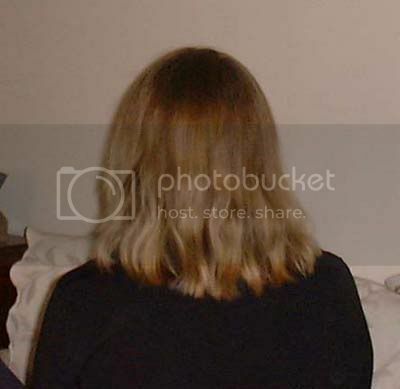 I'm sure it is possible, but during the 12 years I worked in the salon, I saw some people put their hair and scalps through all sorts of torture, only to have it bounce right back. If I learned anything at all by doing hair it is that it (our hair) is a lot stronger and more resiliant than we give it credit for. Think how strong a fine strand of silk is and I think it's made up of proteins as is our hair. I'm not certain about that though. I guess what I was trying to say was that if your treatment of your hair in the past caused any damage that with good care I really believe it can recover. And fine hair has its own beauty; when well kept it is shiny shiny shiny and silky. It's not limp; its silky! But I used to get perms, too and getting used to your own texture can take some adjustments in your thinking. I bet your hair is very pretty; maybe you just haven't realized it yet. I mean this as a compliment; I'm tired and not sure if I'm expressing myself very well. Thank you Strawberryfine!! I needed to hear that today. probably chopped it off a long time ago otherwise. You used the "P" word!!! Now, I know you've got enough willpower to avoid doing that to your hair, Babyfine!! Still, I can empathize with you. I always loved how easy my hair seemed to be when it was permed. But oh-my-word I regretted it every time when I had to deal with the damage. my hair, such as colored, permed ,cut, CHOPPED! I've been trying to avoid that and stay the course.